Many of us can now control our household devices remotely, turning our central heating on or off on our way to work, or programming lights to come on when we are away from home. 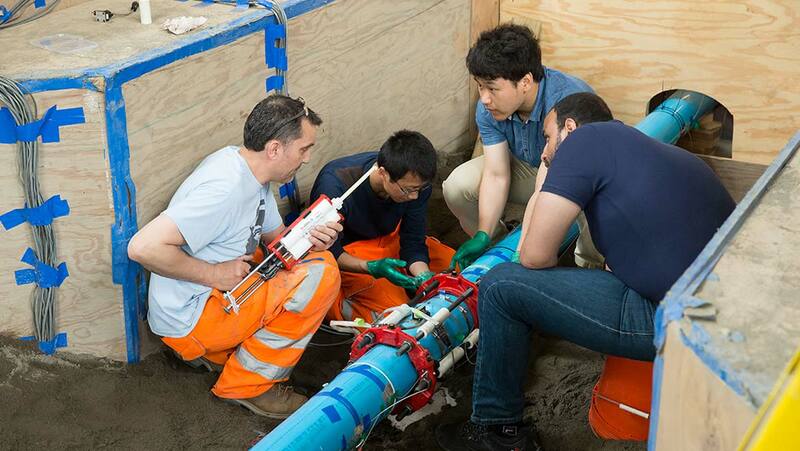 Now, engineers at Cornell University are looking to extend this type of technology by creating intelligent infrastructure which can monitor underground pipework. Any number of events can lead to damage to pipework infrastructure, including natural disasters such as earthquakes and flooding, to man-made issues including damage from construction work, blockages and ruptured pipes. The new technology being developed includes sensors and a new type of pipeline designed to withstand greater levels of stress without rupturing. The sensors were developed in tandem by the University of California, Berkeley, and the University of Cambridge Centre for Smart Infrastructure and Construction. Each sensor is capable of measuring movement, leakage, temperature and strain, capable of recording up to a thousand measurements per second. The tests were carried out at the Cornell Geotechnical Lifelines Large-Scale Testing Facility. During tests, the sensors were placed along a new type of pipe developed by the company IPEX. The pipe is made from polyvinylchloride which in itself is not unusual at all, however the fact that this material is molecularly oriented is a new innovation. This means that the pipe is designed to bend, stretch and compress. The company designed the pipe with these new properties so that it is more likely to remain intact during both natural disasters and construction in the grounds above the pipe’s location. A 40-foot section of the new pipe was installed with the sensors before being buried under 80 tons of soil. The team then simulated the rupture of a fault line in order to discover more about how the pipe would behave when faced with an earthquake. Given that the companies who install these pipes want to minimise maintenance whilst also ensuring a seamless service to their customers, these sensors could certainly become a key aspect of the installation of infrastructure in cities around the world. Tom O’Rourke, Principal Investigator of the project said, “"This is about having feedback and intelligence for underground lifeline systems, such as water supplies, electric power and telecommunications, which provide the services and resources that define a modern city. It's pretty clear to me that within 20 years there will be intelligence integrated into every aspect of infrastructure."